If you are planning to take your would-be better half to a wedding destination of beauty, nothing seems to captivate your mind most other than Greece. It is truly a splendid nation for vacations and weddings. Of all the Greek regions, it is Santorini where weddings are just charming beyond what one can think about, with its pristine beaches and distinct traditions. The Santorini Island is a famous destination for several couples coming from different regions of the world. Getting married on this island is surely going to impress not only you or your consort, but also your guests who will be happy to take some happy movements at home. With these facts, it is not surprising to know that Santorini is considered as one of the most romantic Mediterranean islands. There is no doubt that Greece is home to numerable celebrity vacations as well as weddings, thanks to its premier upscale hotels and spectacular. However, Santorini in the southern area of the Aegean Sea stands out for weddings. For those who do not know, it is the largest archipelago in the country where the profusion of luxury hotels with keen couple suites promises a fairy tale wedding. So, let’s check out what you should expect from a santorini wedding. If you wish to plan your wedding beachside, you can expect fun activities and traditional customs to accompany your guests. Irrespective of season you choose, the weather of Greece is almost ideal. This means that you can plan to wed in Greece in any month without worry. 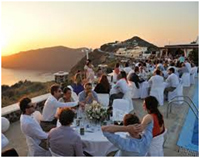 Further, with a naturally pristine backdrop, most weddings in Santorini make a memorable and an exceptional event. A majority of couples choose a 5-star hotel for their wedding and reception because most of these hotels overlook the beautiful beaches or mind-blowing landscapes. However, booking a luxury hotel might be somewhat tricky. This is because the island is one of the most crowded Greek locations due to which 5-star accommodation may not be available. Therefore, it is wise to plan early in order to prevent a rise in your budget later. Of all the destinations, villages such as Fira and Kamari are ideal for weddings because they provide a breathtaking vista of beaches as well as customary architectures. Of all the months, August is the peak month for visitors as well as weddings. Therefore, a wise approach would be to plan your wedding before or after this month so that you can enjoy some reduced hotel rates. You will be able to find several wedding planners in Santorini, who have specialized in offering exciting wedding packages for those who wish to arrange for the event on the island. These professionals, with their sharp eyes, can arrange for everything for a memorable ceremony, including the luxury hotel suite with the maximum possible demands. They provide many services such as transfer from the airport or port to your hotel, reception, documentation, decorations, cocktail parties, bachelorette parties, catered buffets, DJ music, and photographers. Moreover, a few planners in Santorini also offer additional services such as make-up and manicure, hair dressing, wellness programs, and massage treatments for the bride in a dedicated bridal room in a luxury hotel. The Santorin wedding planners can even arrange for orthodox, civil, catholic, or other religion wedding by making a Priest or Pandit available. You do not have to worry about church bookings as they will take care of it by choosing one from the 250 churches on Santorini. The planners also take pride in providing alternatives for married couples who desire to re-affirm their vows during their vacation in Santorini. Bio: Stephon White is an event planner who has organized more than 30 weddings in past one year. In her free time, she researches about the different wedding planners along with how they function. She recommends weddingingreece.com/santorini-wedding/ for wedding in Santorini.